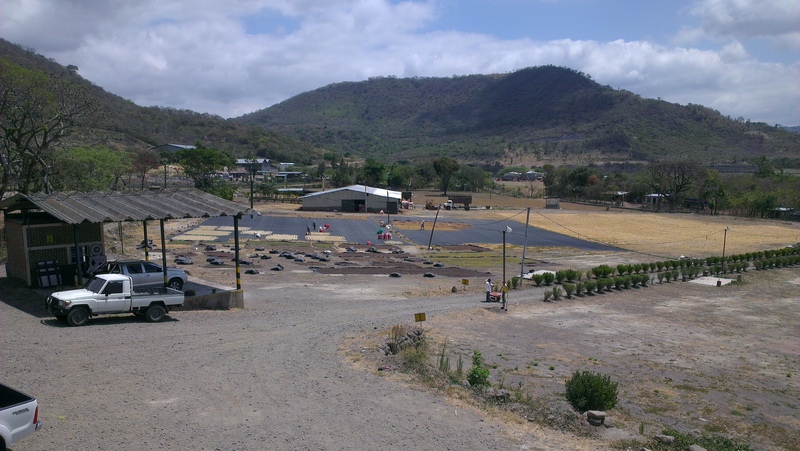 It’s the dry season in Nicaragua, and as we drove from the airport the smell of burning grass filled the warm air. 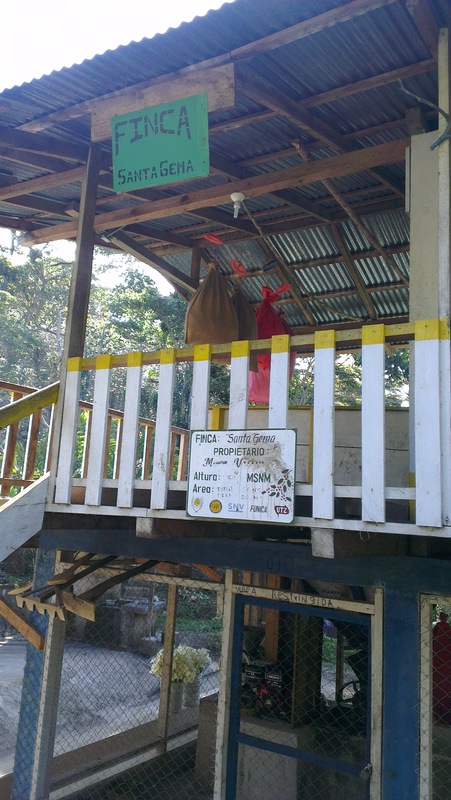 Once into coffee mill country, I was a bit troubled to be passing some large exporters where bags and stacks of parchment sat outside in the sun, surely baking nicely in the hot rays. Seemingly a widespread practice, it was a new sight for me, as was the way most people here dry the parchment: on tarps laid directly on the ground. You never cease to be surprised by new knowledge in this business. I was picked up by Erwin Mierisch, a friend and producer we’ve worked with before but not yet had a chance to visit. 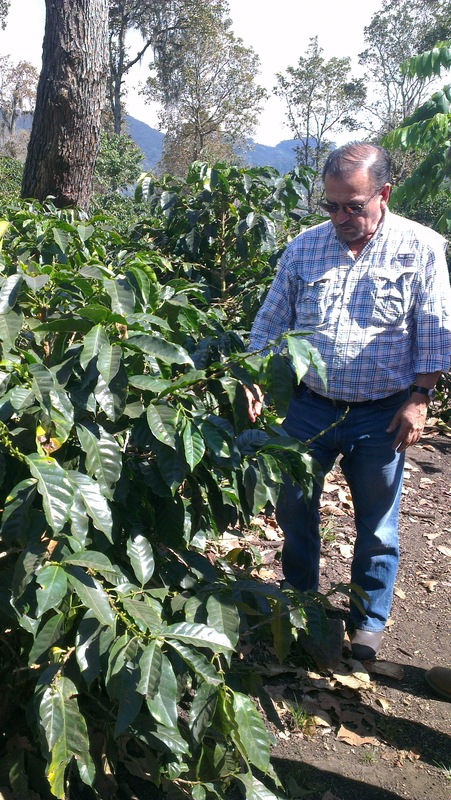 He and his family own several farms and run the mill Don Esteban, milling for themselves as well as a few other growers in the area. 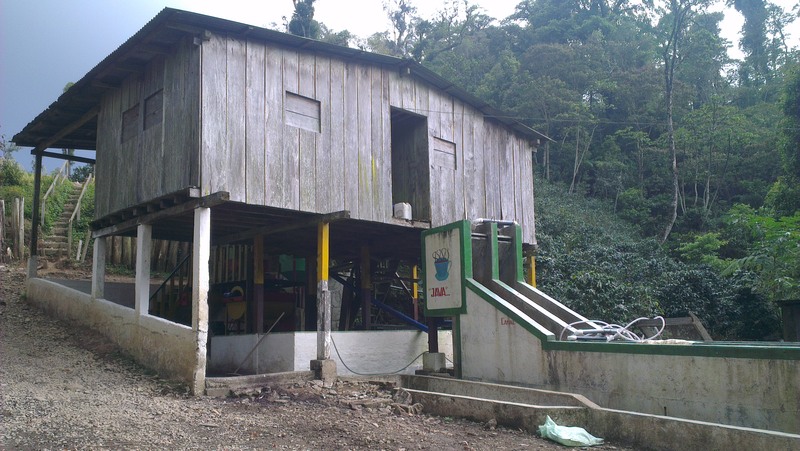 The mill is about 13 km outside of Matagalpa, the farms are in Matagalpa and Jinotega, and recently they also bought a couple of farms in Honduras. 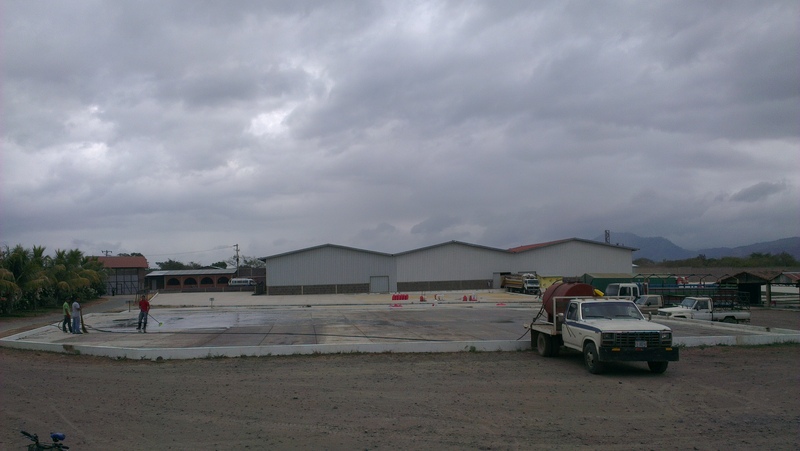 Questioned on the drying practices, I was relieved and interested to hear that they are working on building 3-tiered drying beds, as well as doing more experiments on how to combat the typically huge humidity changes in the area. 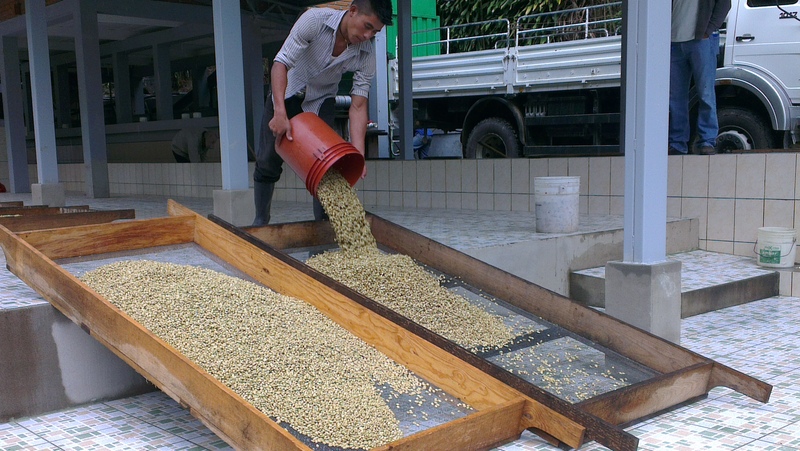 Generally the goal is to dry slower and in stages, to stress the coffee less preventing it from aging quickly in storage. 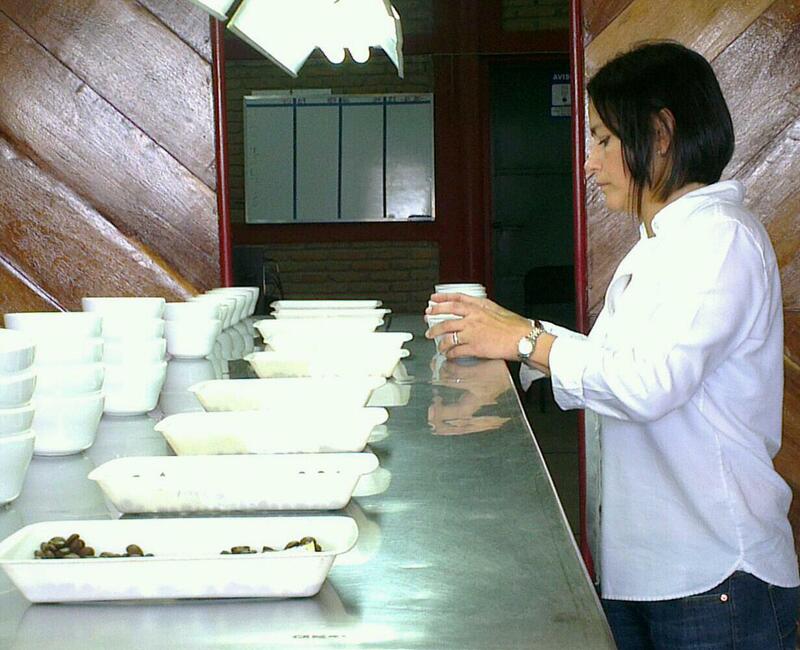 Across my visit I spent a lot of time cupping day lots from the various farms on offer, trying to identify the lots we want to buy this year. 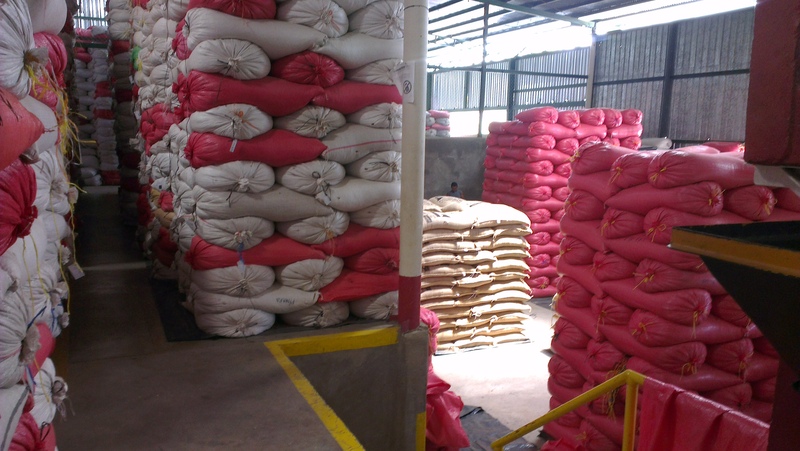 I was pleased to find several tasty coffees that will fit with our profile, so I hope to have a container ready to ship by the end of the month. 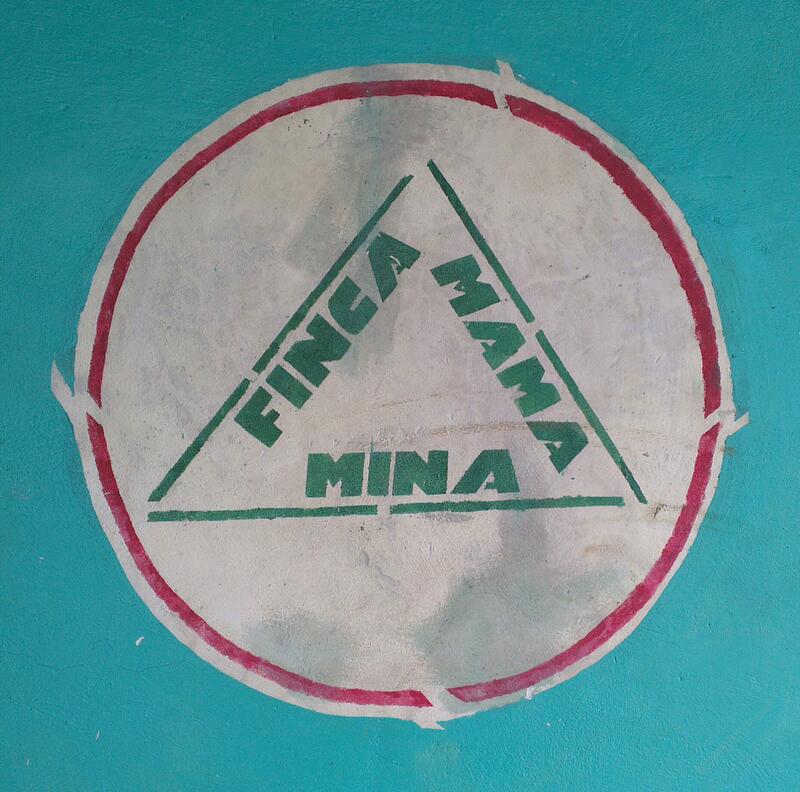 I also wanted a chance to visit some of the farms we’ve had on offer before, and hope to have on offer again, such as Escondida, San Jose and Mama Mina. 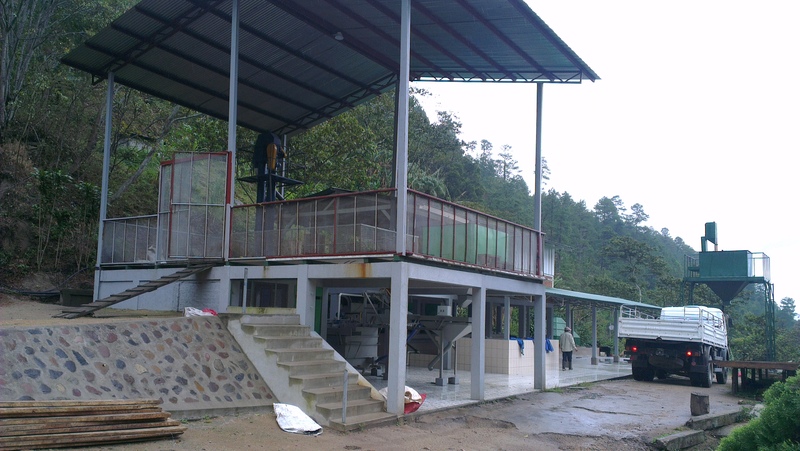 On site at Finca Escondida in Lipululo, Jinotega, sits the Escondida wetmill that pulps both for that farm and next door San Jose, as well as 3 other neighbouring farms. 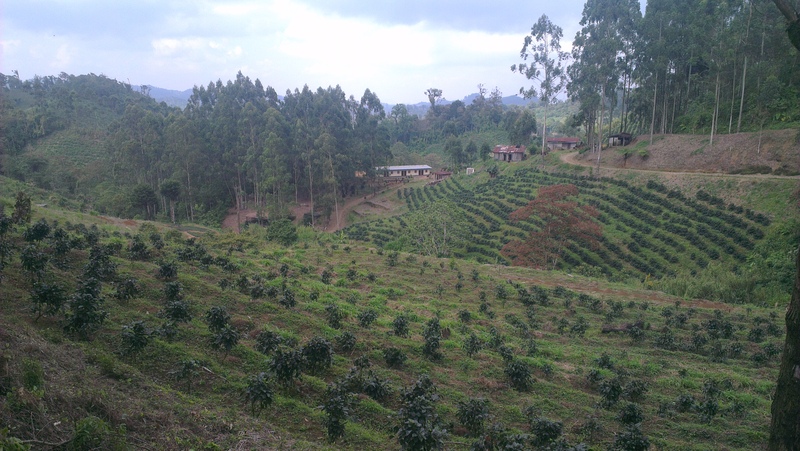 Escondida used to be a cattle farm, but now has various plots with varietals such as Ethiosar (also referred to as Ricardo), Java and Red Caturra, Bourbon and Caturra Estrella. 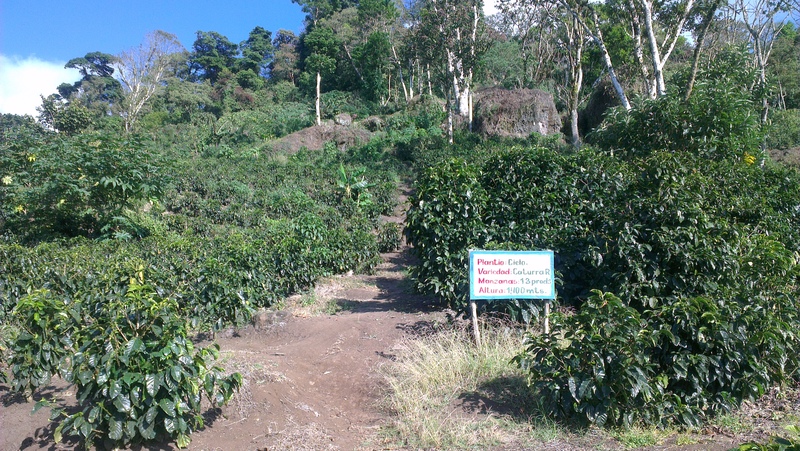 The farm spans altitudes of only 975-1230 masl, but is very well shaded and well managed by Boanerje Martinez Montenegro. 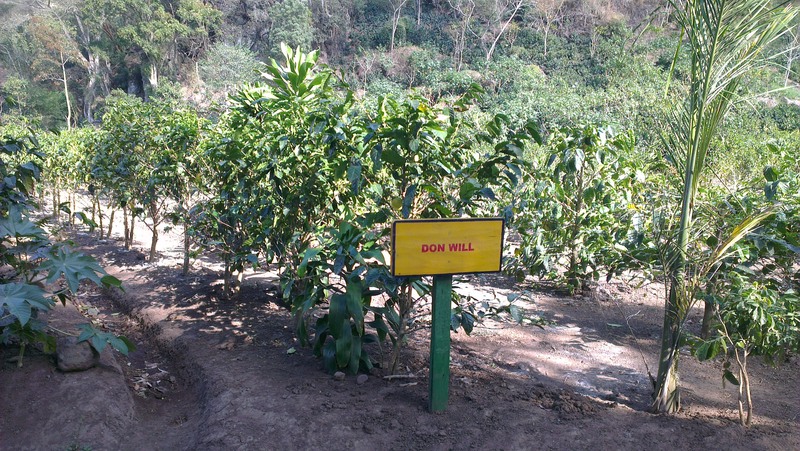 At Escondida they also have a varietal garden, with trees such as Don Will (a Guatemalan variety that their grandpa brought with him when he moved to Nicaragua), Geisha, Laurina, Hibrido de Timor, Caturra Estrella, Red and Yellow Pacamara, Biachar Agobio, Ethiopia Maracuya, Africano and Bourbon Africano and Java. 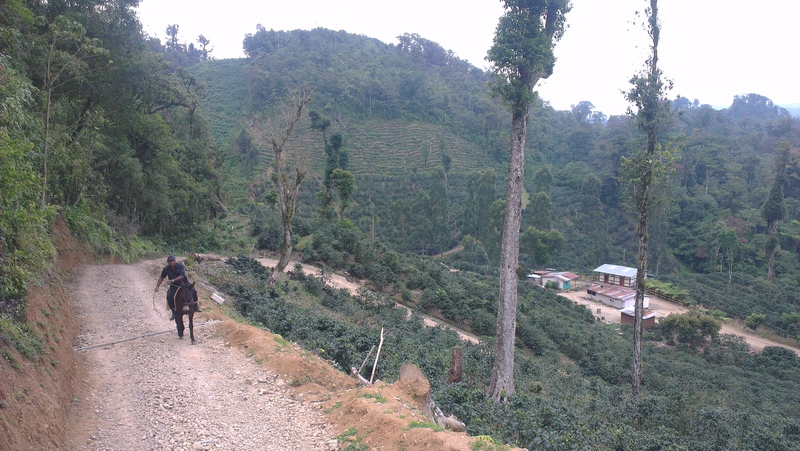 Further up the road from Escondida you find Finca San Jose, running from 1250 to 1400 masl. Here you’ll mostly find Caturra, Caruai and a bit of Java. 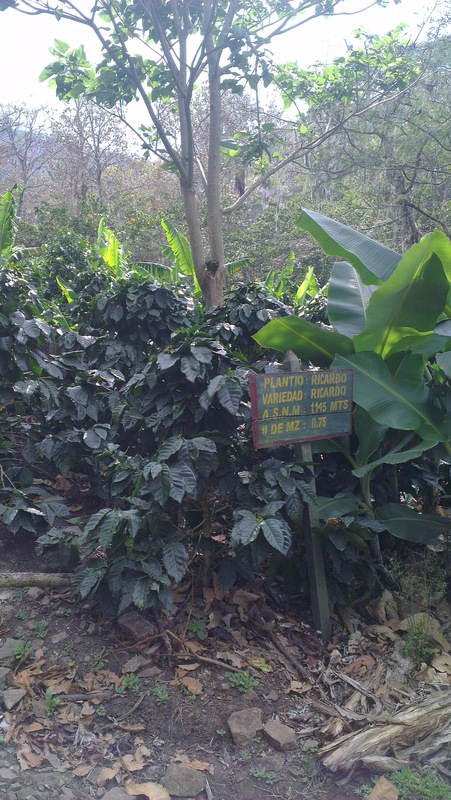 There were also a few Yellow Pacamara trees, which from the taste of the cherry wasn’t as sweet as the Caturra for example, but will be interesting to cup nonetheless. We ran into a picking crew sorting the less ripes of the day’s picking, loading finished bags onto a tractor ready to take it down to the wetmill. From this farm you have a great panoramic view of Lake Apanác, a reservoir created by the dam on the Río Tuma to the north of Jinotega. 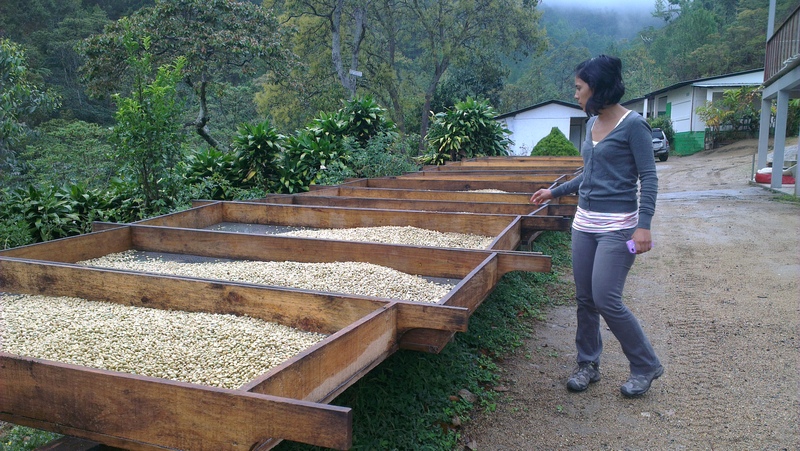 In Laguna Verde, Jinotega, you’ll find neighbouring farms Los Altos and Mama Mina (also called La Minita). Los Altos came under the Mierisch’s ownership only 4 years ago, taken over from a cousin who wanted to move into politics rather than coffee growing. The area has a lot of cloud cover so there is very little need for shade trees, and the altitude of 1274 to 1400 masl keeps the temperature nice and cool for the Catuai, Caturra, Maragogype, Pacamara and Mundo Nuovo trees. At Los Altos they have also built dorms for the pickers, since the location is a bit more remote than most the other farms. 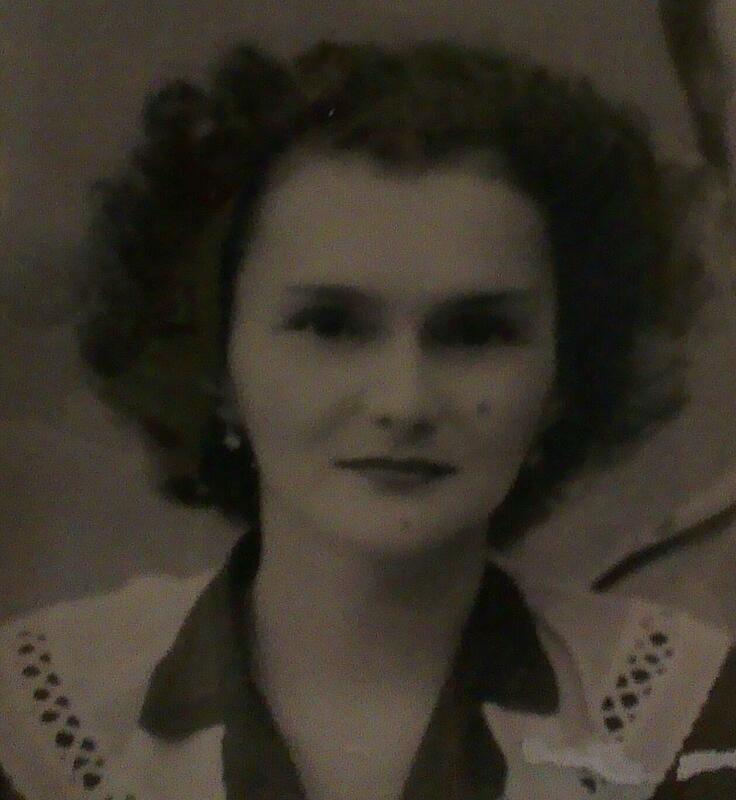 Agnes. 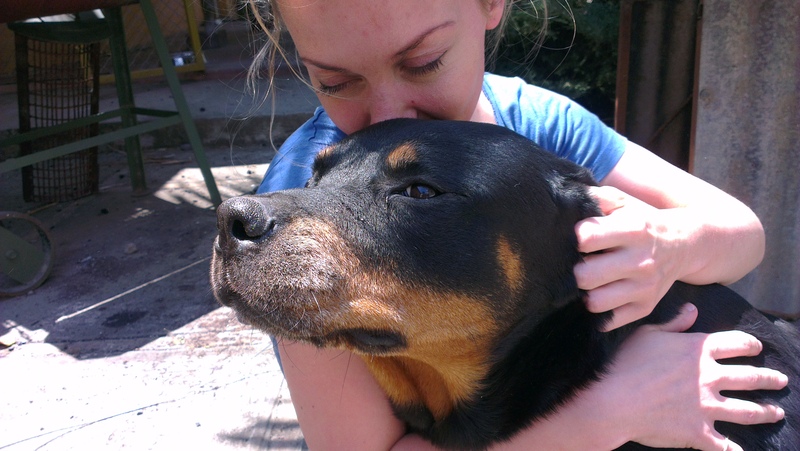 Always time for a cuddle. 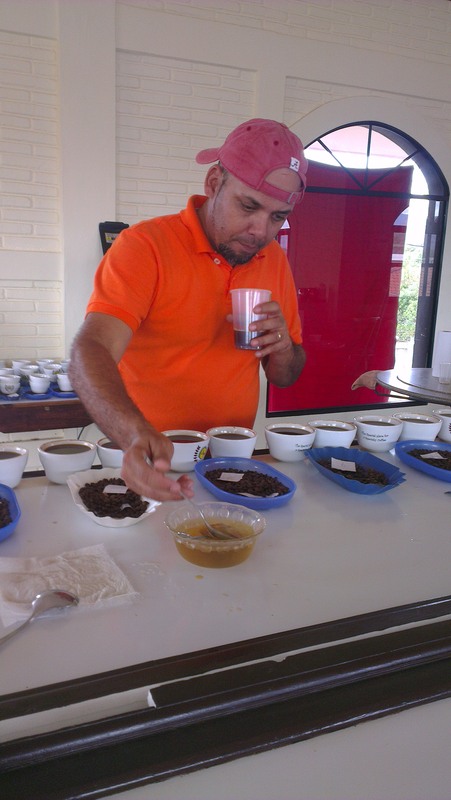 I also went to Ocotal to visit the Las Segovias mill, which processes a lot of the Nicaraguan Cup of Excellence winning farms from the Nueva Segovia region. 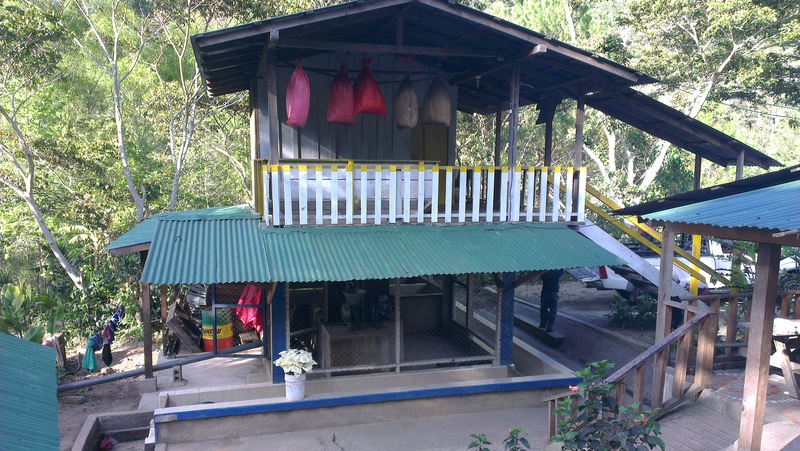 It is headed up by Luis Alberto Balladarez, who also has his own farms coffee processed here. 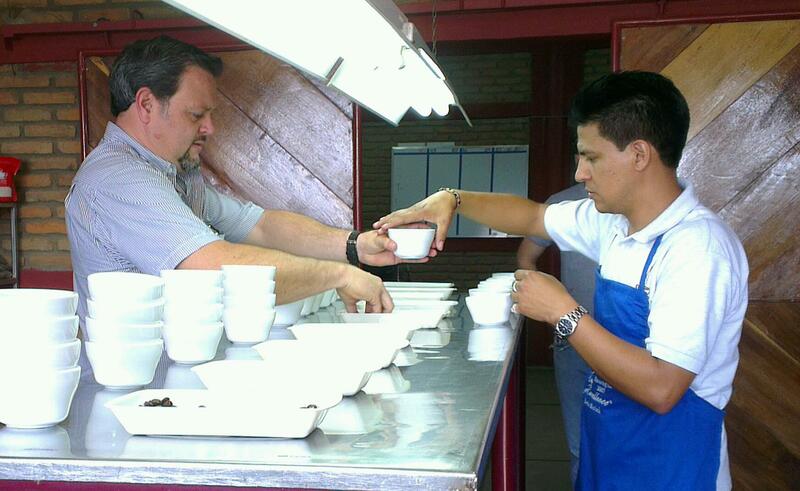 When we cupped some of the coffees on offer, his farms were consistent stand outs, so I hope to get some of those lots in this year. With Claudia Lovo the sales and marketing manager we drove to Mozonte to see Luis’ farms Un Regalo de Dios and La Esperanza and the wetmill where they are pulped. As we walked around the fields with farm manager Filadelfo Lopez, picking was still going on and I was interested to learn that these guys sometimes purposefully pick to various levels of ripeness according to the preferences of their customers, depending on whether they want more acidity, body or sweetness. What I could see left on the trees was a lot of burgundy, full of both sweetness and body. Starting picking at 6am, there are two collections/deliveries to the mill at 11am and 4pm. Using loud whistles as the signal to gather, pickers started appearing with their sacks for the 11am collection, and I got some footage of how they track yield and calculate wages. 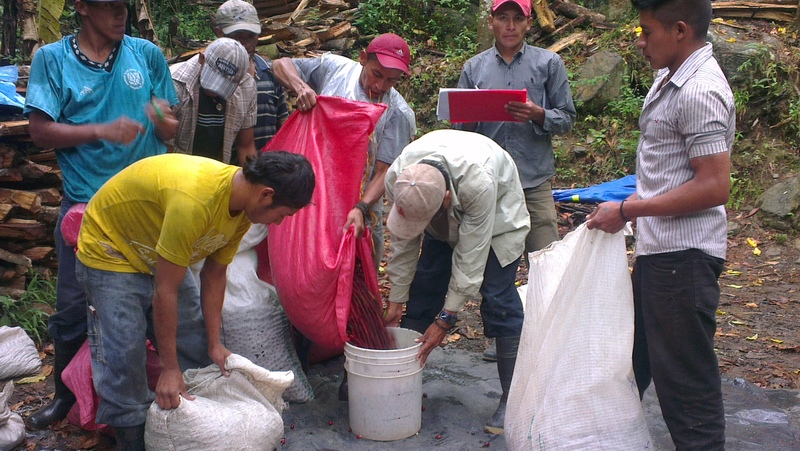 They are paid by buckets called latas and normally fill about 7-8 latas of 28kg a day. 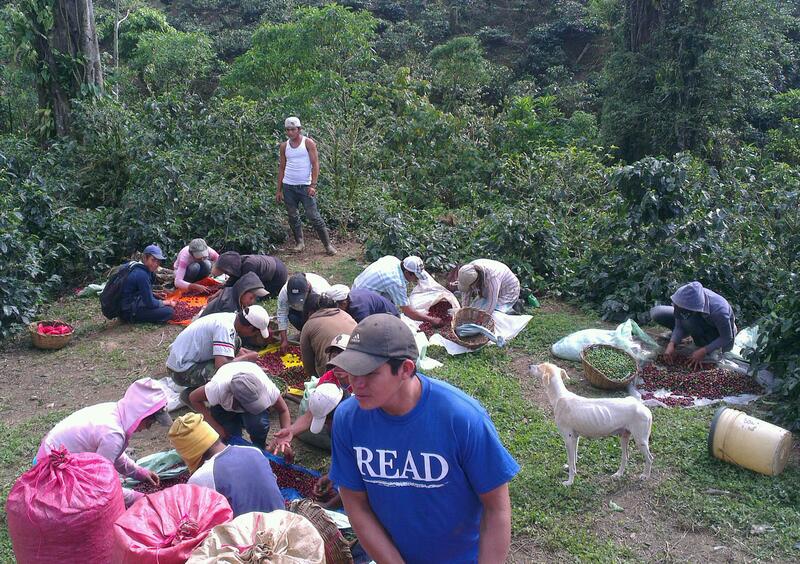 While the government standard is 33 cordobas per basket, here they will earn 33 cordobas against picking only ripe. The wetmill was built 4 years ago and is one of the cleanest mills I’ve seen in a while. Someone was nearly permanently hosing down the tile and scrubbing everything clean, and even if the cherry is transported in bags, the back of the collecting truck was thoroughly cleaned between each delivery too. 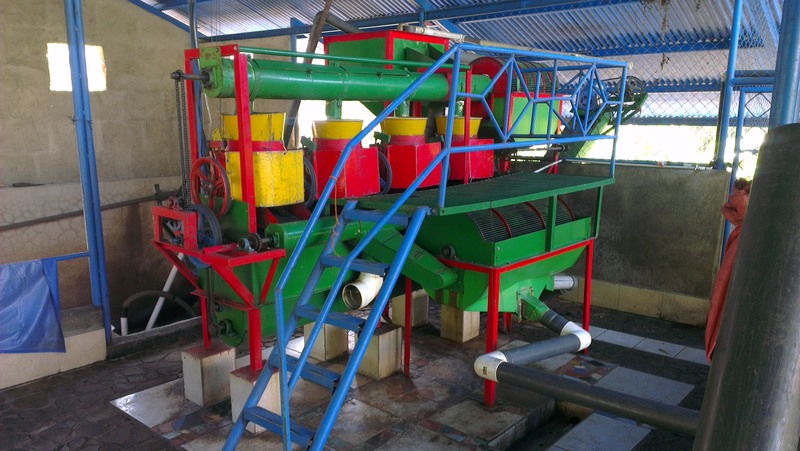 The cherries we’d seen being collected was to be processed as honey and once thoroughly cleaned they fired up the Penagos pulper. 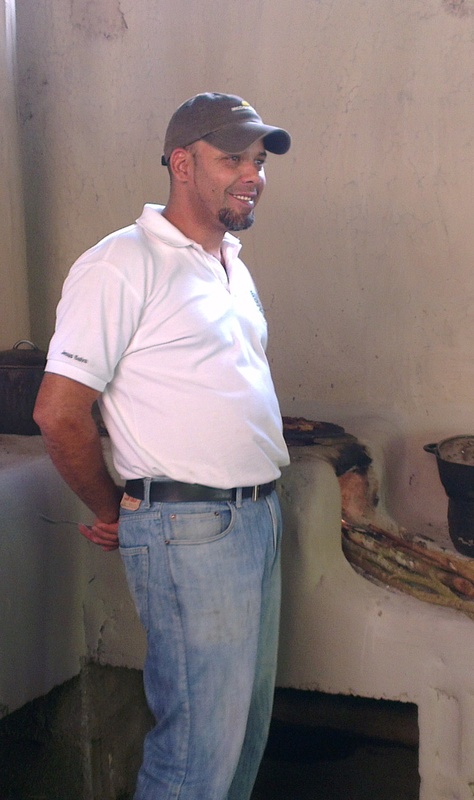 I also got to visit Santa Gema, another Mozonte farm belonging to a young producer called Mario Jose Vilchez Urbina. His nursery and mill is at Santa Gema, so we started there having a lovely lunch and a chat about his farms. He already has three years of placing in the COE behind him, and also runs fincas Santissima and Escondida. He’s had Santissima since 1995, acquired Santa Gema in 1999 and took over Escondida in 2007. 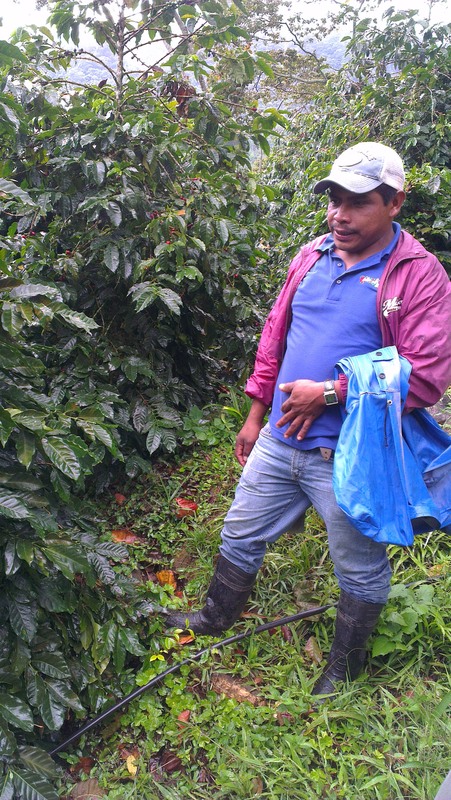 We had a chance to cup his coffees together at Las Segovias later on, and this is definitely the sort of producer we’d love to work with, quality focused and looking to continuously improve.